Reposted from the Smithsonian Cooper-Hewitt blog . The International Contemporary Furniture Fair is a fun place to visit each year for new trends and ideas in commercial design. One project in particular highlights a rising trend in product design and marketing. The product-design program of the University of Oregon School of Architecture and Allied Arts challenged students to develop a piece of furniture out of a single sheet of plywood. While the brief was interesting enough, flat-pack design is not new. 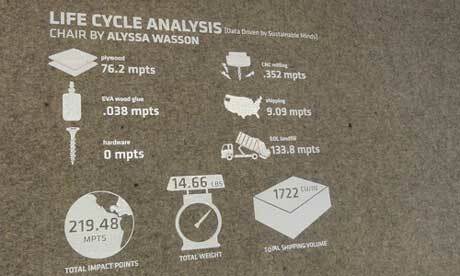 The important twist here was a lifecycle analysis (LCA) of each design, comparing the furniture on various metrics such as materials, fasteners, glues, and shipping volume, using software by Sustainable Minds. It was fascinating to see how each design had greater or fewer impacts based on decisions such as having a flat or a curved seat. What if every product in this year’s ICFF had undergone the same LCA?